Tours and Travel agency in San Francisco. Opened its office in San Francisco in 1991, headquartered in New York. Japan Rail Pass (JR Pass) : Green and Ordinary for 7-days, 14-days, or 21-days pass. Tickets for Sports Events, Musicals, etc. – Competitive rates on more than 400 airlines worldwide. – Over 100,000 hotels in 20,000 locations around the world. – Access to various activities throughtout the world. 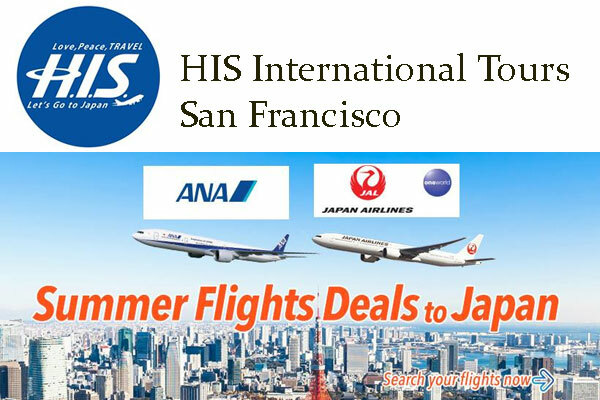 – hisgo is powered by H.I.S., a travel agency with global presence in over hundred citites worldwide. Closed : Sat, Sun, and Holiday.